The association has the power to award Honorary Life Membership to people who have made a significant contribution to its work over a number of years. One member has made such a contribution, not necessarily in recent years but certainly during earlier times and it is probably the case that without her enthusiasm and vision, the association wouldn’t be what it is today, if in fact it was here at all. She was a committee member serving in a number of roles, not least as treasurer where she made her mark. 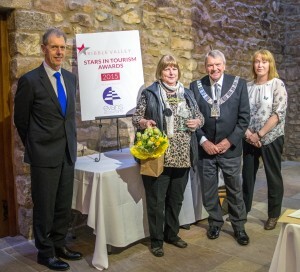 Frances Ahearne, of Stonyhurst College has been an active supporter of the RVTA for many years, and in her role at Stonyhurst College has also encouraged the use of the college as a tourism and events destination. Often working behind the scenes, she has always taken her roles and responsibilities seriously, with the good of the association as her primary concern, the award Life Membership of RVTA goes to Frances Ahearne.